For us, it all started with tennis, so it’s no surprise that the facilities we offer are second to none. 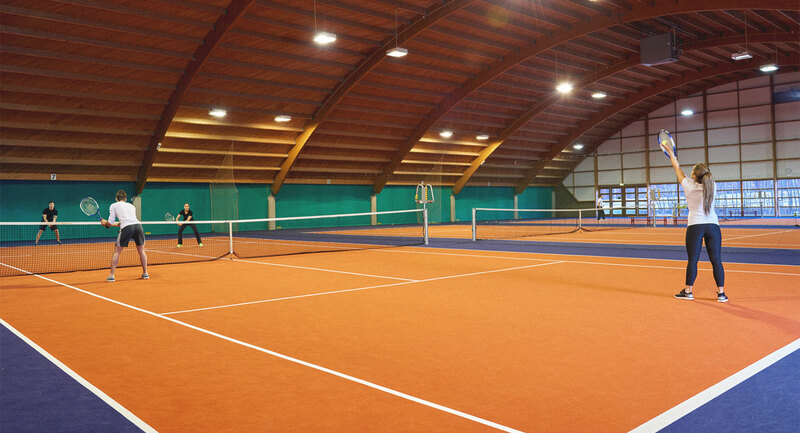 We’ve got seven indoor courts, alongside ten outdoor meaning you can play all year round. But it’s not just tennis that’s on offer, we also have four squash courts, four badminton courts, and a Multi Sports Hall which we use for basketball. There really is a sport for everyone here at David Lloyd Eindhoven. The Tennis Club at David Lloyd Eindhoven has about 200 members and we’re looking for more! The ‘club in ‘club is connected to the KNLTB so there are always opportunities to attend official leagues and tournaments. If you’d like to play tennis in a team, or against other clubs, please register for the external (KNLTB) competition. Or, if you want to play in a league and play games when it suits you, you can register for the ‘open’KNLTB tournaments. Since 2006, David Lloyd Tennis Club TCDL has also run its own tournaments. It’s easy to join the tennis club, just fill out the registration form available at reception and we’ll help you complete your payment. Whether you’re a total beginner, or really advanced, you’ll enjoy the tennis here. We’ve got a thriving community, with lots of players of all levels and plenty of social events, so you’ll soon meet someone new to play. Plus, we run lots of different tournaments throughout the year for tennis, squash and badminton. And our instructors are superb, whether they’re teaching kids essential skills, or giving a group or individual lesson, they’ll inspire you to improve.